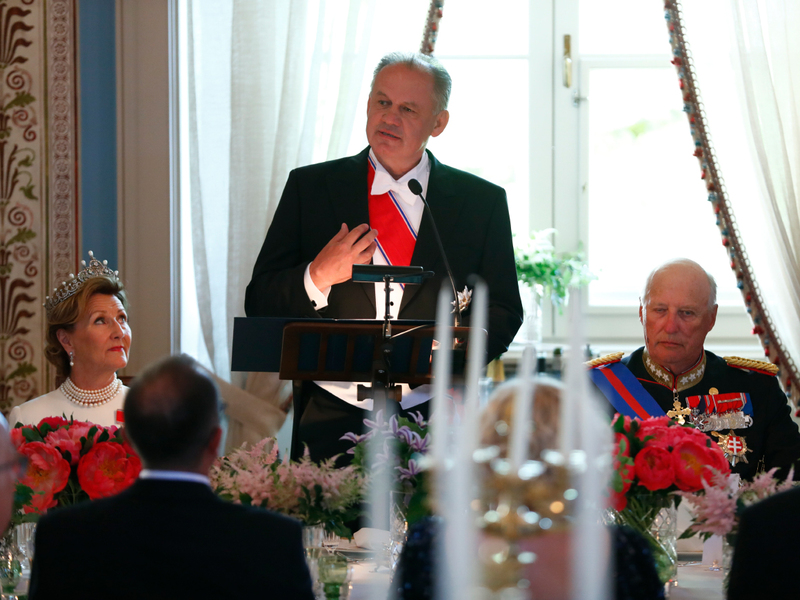 Speech given by His Majesty The King during the gala dinner at the Royal Palace given in honour of the state visit from Slovakia 4 - 6 June 2018. It is a great pleasure for the Queen and me to welcome you to Norway, Mr President. Eight years ago, we had the privilege of visiting your beautiful country. I remember particularly our visit to one of your cultural treasures – the mining town of Banská Štiavnica (Banska Stavnitsa), registered on the UNESCO World Heritage List. Slovakia has indeed much to offer – both in terms of scenery and culture, situated as it is in the heart of Europe. Slovakia – like Norway – had to fight for its national identity and independence. Nobel Prize laureate Bjørnstjerne Bjørnson was an inspiration for people in both our countries. He was actively engaged in the cause of your people at a time when you were fighting for the right to your own language and identity. “My fight for the Slovaks costs me a lot of time, which I need especially for my literary work. But I am not complaining, because it brings me joy. I can tell you that I have never in my life received so many thanks, and that also has a value,” Bjørnson wrote in a letter in 1907. When the Queen and I visited Slovakia in 2010, we were greatly moved to see how Bjørnson’s legacy is still cherished - more than 100 years later. 2018 is a significant year for Slovakia. The Queen and I would like to congratulate you on the 100th anniversary of the establishment of the first Czechoslovak Republic – as well as on the 25th anniversary of the Slovak Republic. Norway and Slovakia enjoy excellent relations. As close allies in NATO, we work together to secure peace and stability in Europe and internationally. We are both strong supporters of multilateral cooperation, and we work closely together in the UN. Norway values the good cooperation we have with Slovakia in Europe – as partners in the single market and in Schengen, and in the context of EU foreign and security policy. The EEA and Norway Grants have been, and will continue to be, an important platform for cooperation and building friendships between our two nations. I hope that today’s business conference and the visits you make to Norwegian research institutions and business clusters will be fruitful and will spur further cooperation. Culture and sport often bring people closer together. Our cooperation in the cultural field is flourishing. The books by Norwegian bestselling authors available in Slovakia today are quite different from the works of Bjørnstjerne Bjørnson – but they are equally fascinating. I expect that some members of your delegation are familiar with Jo Nesbø’s fictional character— the hard-boiled detective Harry Hole. They might even like to visit some of his favourite hang-outs while in Oslo. I hope you are brave! Tomorrow, the Slovak National Theatre will perform at our National Theatre. The Queen and I are honoured that you, Mr President, have chosen a Bjørnson play to be performed in Slovak – as your cultural presentation to Norway. When it comes to friendly competition in sports, let me commend your country’s achievements during this winter’s Olympic Games: Anastasija Kuzmina won several medals in biathlon events – a sport we Norwegians like to win! Both our nations have done well in the Paralympics, and this year Slovakia excelled, particularly in slalom. I have also been informed by reliable sources that you yourself are a skilful skier, Mr President – and that you even tested the slopes in PyeongChang while visiting the Slovak team. I am sure you and the Queen will have a lot to talk about during this evening! Finally, I would like to mention last year’s World Championship in cycling in Bergen. Peter Sagan’s victory – where he finished just centimetres ahead of our own Alexander Kristoff, was admired – even by patriotic Norwegian fans. That brings me to Bergen, which is the final stop on your visit. The Crown Prince looks very much forward to showing you this hanseatic town. Even though we are situated at the very North of Europe, Norway’s ties to the continent go back many centuries – through our trade routes across the sea. Let me end with a quote from Bjørnson: “Good deeds save the world”. Bjørnson’s actions and values should be a source of inspiration for all of us – also today. With these words, I would like to invite all of you to join me in a toast to Mr Andrej Kiska, President of the Slovak Republic, to the people of Slovakia, and to the friendship between our nations. 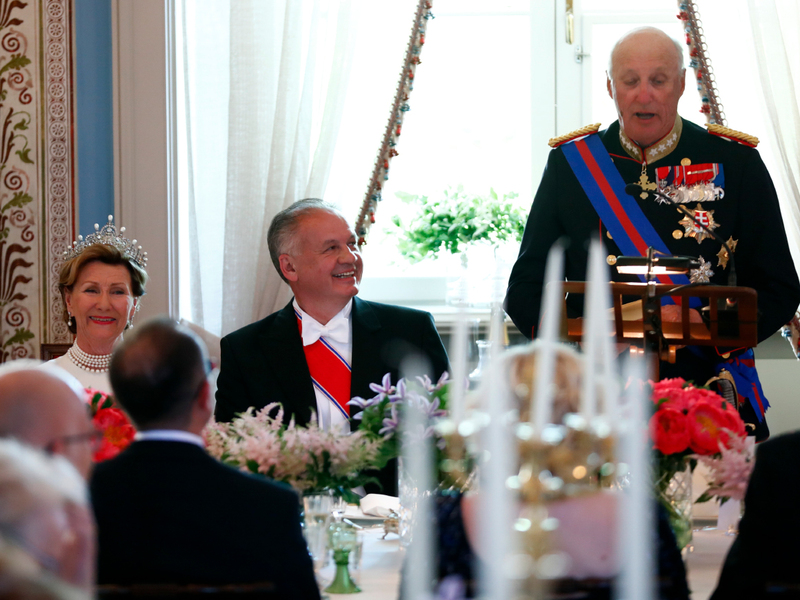 King Harald gives a speech in honour of the President of Slovakia, Andrej Kiska. Photo: Heiko Junge / NTB scanpix. Diplomatic ties were established between Norway and Slovakia on 1 January 1993, when Slovakia became an independent state after the dissolution of the former Czechoslovakia. The Norwegian Embassy was established in Bratislava in January 2005. King Harald, accompanied by Queen Sonja, paid a State Visit to Slovakia in October 2010. Cultural and trade cooperation between Slovakia and Norway is on the rise, due in part to Norway’s support to Slovakia via EEA and Norway Grants. Roughly 20 Norwegian companies have been established in Slovakia. Some 600 Norwegians are studying in the country, and most of these are studying medicine. Official photographs from the Bird Room: The King and Queen with President Andrej Kiska. Photo: Gorm Kallestad / NTB scanpix.